And now everyone is speculating as to whether the shadow of Jack the Ripper lurks behind this mysterious Whitehall murder. I think that if gentlemen like myself wasted a little less time on the newspapers’ fabrications and instead rolled up their sleeves, we would live in a better city. After the savagery of Jack the Ripper’s murder spree shocked all of London, it was a criminally short amount of time before a new series of grisly horror occurred in October of 1888. A bundle of human remains was discovered at the construction site of the new Scotland Yard and, while investigators were reluctant to admit any connection to the Ripper murders, the media and the public remained convinced that Jack had returned to mock the police, leaving a total of four limbs scattered throughout the Whitehall District. 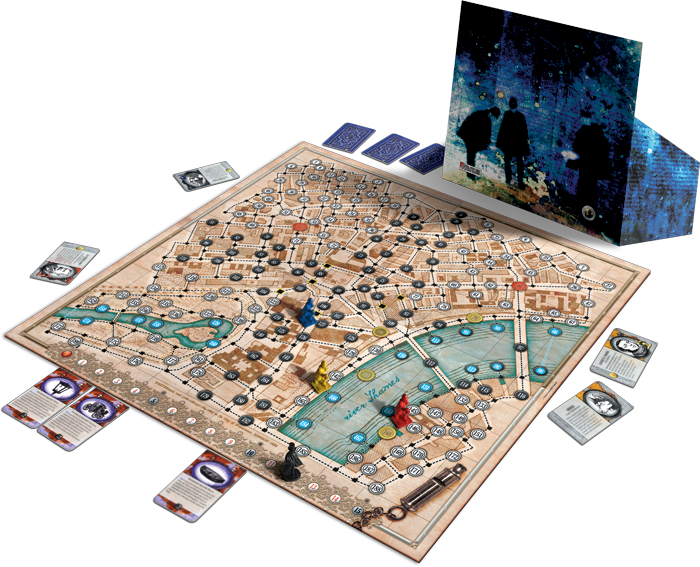 In Whitehall Mystery, the new standalone game in the Letters from Whitechapel series, players become both Jack the Ripper and investigators of the Metropolitan Police. This time, players maneuver through a new, smaller district of London, moving from Whitechapel to Whitehall. Before you begin your evasion or pursuit through the streets of London, Fantasy Flight Games is pleased to offer you a preview of the vibrant and dangerous Whitehall District, the setting of Whitehall Mystery. 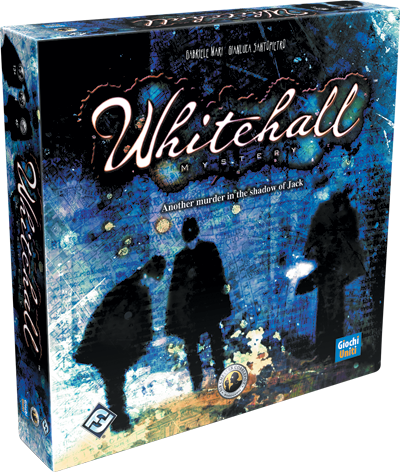 The condensed map of Whitehall Mystery offers players a streamlined gaming experience in this fast-paced strategic adventure. The pressure is on as Jack has less space to outmaneuver the police and investigators have less time to track Jack before he disappears. 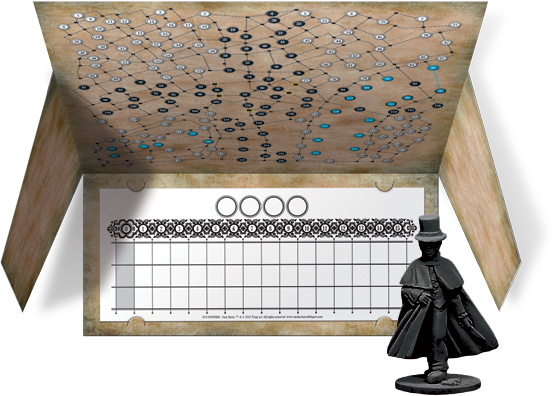 The game consists of four rounds taking place over a series of turns, with Jack first making a move and then the Investigators responding. The round ends when Jack has either made fifteen moves or has reached a new Discovery Location. To track these, Whitehall Mystery comes with thirty Jack Move Track Sheets for the killer to secretly record his chosen Discovery Locations and how he navigates Whitehall with his fifteen moves per round. Once Jack has made his move, the Investigators have their chance to discuss and then disperse. By consulting, the investigators can share their intel and formulate a plan to either search for clues across the largest area of Whitehall, or track down the killer if they believe they know his whereabouts. Compared to the original Letters from Whitechapel, the investigators have less distance to cover, but they also have less manpower with only three investigators, unless they use the optional rule to Hire Reinforcements from the Dear Boss expansion. The close-knit streets of Whitehall also present a new challenge for Jack the Ripper. The killer’s confidence has pushed him to take more risks with this new game of cat and mouse by putting himself in closer proximity to the police than ever before. Staying in one place would ensure his capture and, for this reason, Jack must make a move each turn. He cannot remain on the same numbered circle for two consecutive turns, but he also cannot move over a Crossing occupied by an Investigator figure unless he has a Coach. If Jack cannot make a move, he loses the game. Unlike the Whitechapel District, the Whitehall District is split by the River Thames that flows through the heart of London. 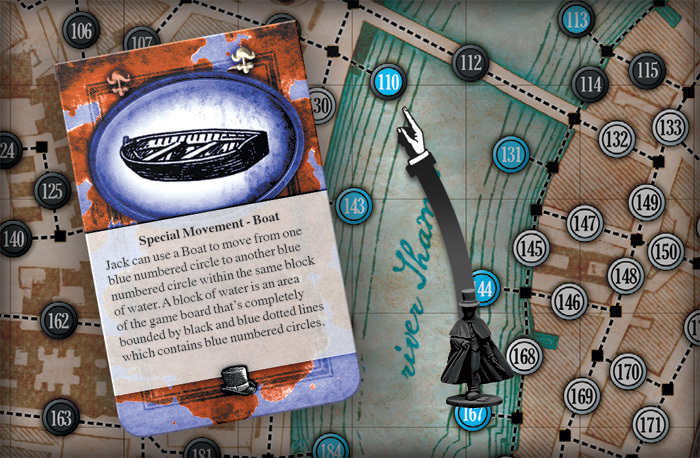 In Whitehall Mystery, the Thames is divided into several blocks of water containing blue numbered circles. These areas are marked with blue and black dotted lines that act as boundaries. To navigate this new location and its water feature, Jack updates his crafty escape tactics by introducing the Boat special movement tile. 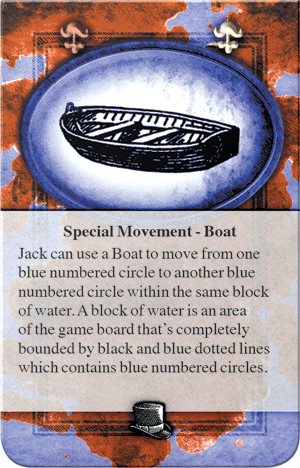 This tile states that Jack can use a boat to move from one blue numbered circle to another within the same block of water. But players should use these tiles carefully as each boat can only be used once. After the tiles have been spent, the Thames becomes a large obstacle that neither Jack nor the Investigators can cross except for only two bridges just wide enough for one person to stand on. This can force saucy Jack into a dangerous situation if he must reach his next Discovery Location on the far bank, but an Investigator blocks his only path. Among the optional rules that players can use to customize the game, Newspaper Fabrications allows Jack to reclaim one alley or boat tile that had previously been used. If Jack finds himself in a scrape with the Investigators closing in, this ability could buy him a freedom for a few moves, maybe just long enough to drop another limb at a Discovery Location. Murderer at Large lets Jack use a Special Movement tile according to the normal rules of the game, but instead of placing the tile face up, potentially giving the Investigators a clue about his location, Jack places the tile face down. Investigators are left to ponder whether Jack has used a boat to cross the Thames, or a coach to pass an Investigator who is not anywhere near the river. Now that Jack has emerged from the shadows, the race is on to ensnare the Ripper before he disappears forever. Explore the Whitehall District in its Victorian glory. Save the city or make it your ghastly playground—the choice is yours! Look for Whitehall Mystery (VA102) at your local retailer in Q3 of 2017!